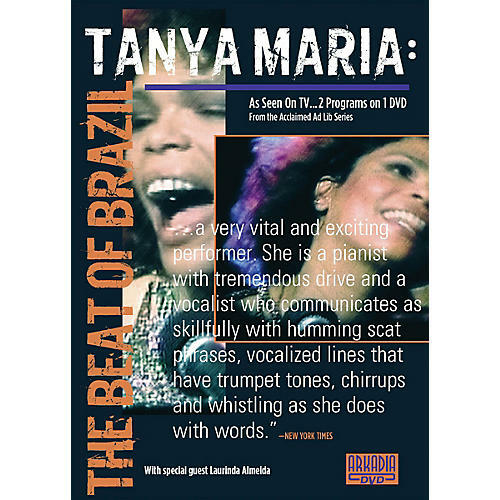 Grammy-nominated Brazilian jazz pianist and songstress Tanya Maria's impressive live act is featured in this DVD, showcasing the full spectrum of her unique amalgamation of genres; all while remaining distinctly and proudly Brazilian. Since her early days, Tanya Maria's sensual vocal tones, tenacious stage performances, and percussive piano style have not only made her one of the true musical originals of her native Brazil, but have created a renowned sound that dazzles audiences in every corner of the globe. This DVD also features one of Brazil's premiere guitarists, Laurindo Almeida, making this DVD a must-own for lovers of jazz, Brazilians, Latin, and world music. Songs include: Lament for Rocky · It's Not for Me to Say · Ven P'ra Roda · Chiclete Com Banana · Claire De Lune · Voce E Eu · Eruption · Yatra-Ta · Jesu, Joy of Man's Desiring · O Que E Amar. 1 hour.